It has been proven on many occasions, that providing windows with roller shutters reduces the thermal inertia of the room. In the winter, the air layer between the glass and the lowered shutter, acts as an insulator and provides measurably better protection against heat loss. It affects significantly causing the reduction of heating costs - savings can reach up to 40%. 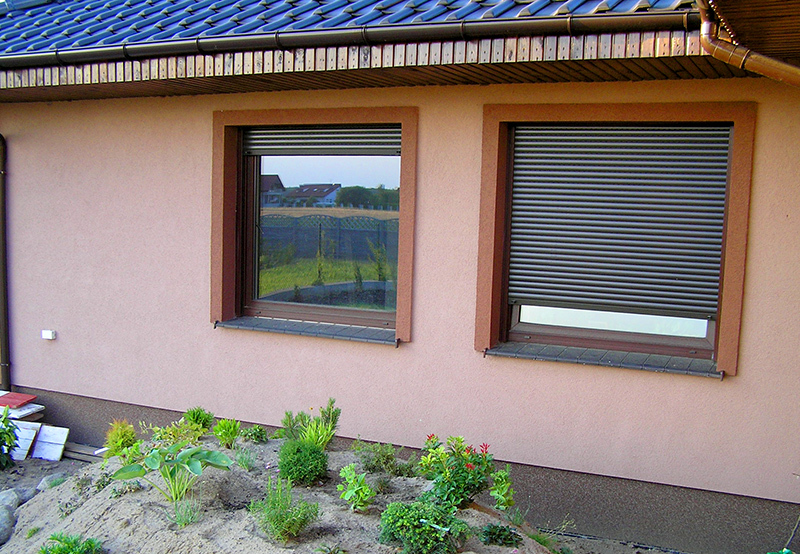 In the summer, leaving the blinds lowered in the areas of high sun exposure prevents over-heating of the premises. This solves the issue of cooling them to a comfortable termperature level, which also turns into real savings. In the case of buildings located in high traffic areas such as railway stations, main streets, airports and so on, the protection against noise is becoming increasingly important. A properly installed roller shutter, after being lowered, can reduce the noise in the interior by up to several decibels. Roller shutters can effectively protect you against the prying eyes of the others. This solution guarantees a clear separation of the privacy zone and cutoff from the outside world. aluplast manufactures and supplies roller shutters for all types of buildings: for these with already installed windows as well as for the ones newly constructed. We offer the top-mounted roller shutters installed together with windows and the adaptation roller shutters to be mounted on the facade of the building. aluplast offers three types of top-mounted and three types of adaptation roller shutters. R-Round-Line - in which, as in the standard, the service cover remains visible, and its advantage is aesthetically pleasing rounded shape. The assumption valid for the profile system program also applies for roller shutters system. They can be mounted on all of the aluplast system window profiles, as well as any other window profile that uses special adapter. The variety of forms and materials used to manufacture roller shutters means unlimited possibilities of application (single-family houses, apartment buildings, commercial buildings, industrial facilities). Wide color palette of the aluminum roller shutters (RAL color palette) and constantly enriched list of available veneers for PVC roller shutters make them, regardless of utility functions, an important decorative element of modern buildings.